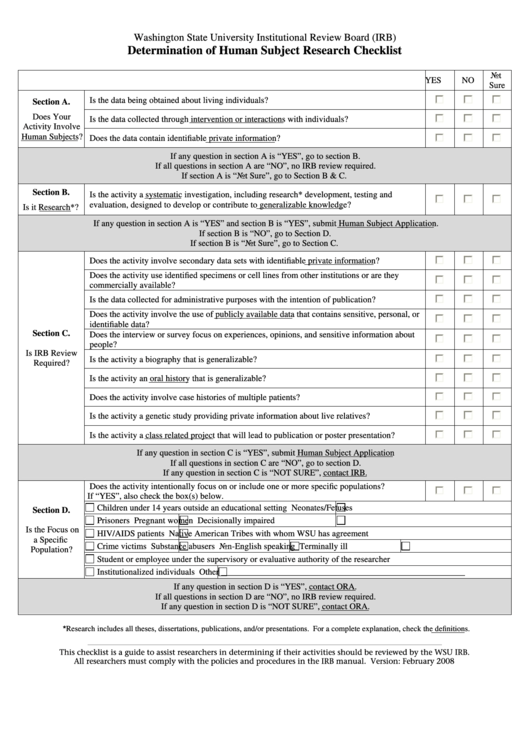 Download a blank fillable Determination Of Human Subject Research Checklist in PDF format just by clicking the "DOWNLOAD PDF" button. Complete Determination Of Human Subject Research Checklist with your personal data - all interactive fields are highlighted in places where you should type, access drop-down lists or select multiple-choice options. Is the data being obtained about living individuals? Is the data collected through intervention or interactions with individuals? Does the data contain identifiable private information? If any question in section A is “YES”, go to section B. If all questions in section A are “NO”, no IRB review required. If section A is “Not Sure”, go to Section B & C.
evaluation, designed to develop or contribute to generalizable knowledge? If any question in section A is “YES” and section B is “YES”, submit Human Subject Application. If section B is “NO”, go to Section D.
If section B is “Not Sure”, go to Section C.
Does the activity involve secondary data sets with identifiable private information? Is the data collected for administrative purposes with the intention of publication? Is the activity a biography that is generalizable? Is the activity an oral history that is generalizable? Does the activity involve case histories of multiple patients? Is the activity a genetic study providing private information about live relatives? Is the activity a class related project that will lead to publication or poster presentation? If all questions in section C are “NO”, go to section D.
If any question in section C is “NOT SURE”, contact IRB. Does the activity intentionally focus on or include one or more specific populations? If “YES”, also check the box(s) below. If any question in section D is “YES”, contact ORA. If all questions in section D are “NO”, no IRB review required. If any question in section D is “NOT SURE”, contact ORA. *Research includes all theses, dissertations, publications, and/or presentations. For a complete explanation, check the definitions. This checklist is a guide to assist researchers in determining if their activities should be reviewed by the WSU IRB.